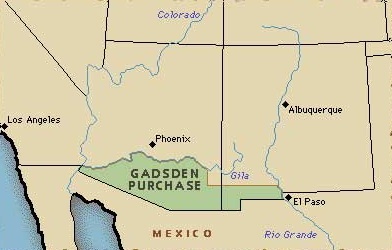 The Gadsden Purchase was roughly a 30,000 square-mile region of present-day southern Arizona and southwestern New Mexico that was acquired by the United States in a treaty signed by American ambassador to Mexico James Gadsden on December 30, 1853. The treaty was ratified, with changes, by the U.S. Senate and signed by President Franklin Pierce with final approval by Mexico on June 8, 1854. The purchase was the last major territorial acquisition in the contiguous United States. U.S. President Franklin Pierce, influenced by James Gadsden’s friend, Jefferson Davis, sent Gadsden to negotiate with Santa Anna for this tract of land. Many supporters of a southern Pacific railroad route, including Davis, believed that a transcontinental route which stretched through this territory would greatly benefit southern states should hostilities break out with the north. U.S. Minister to Mexico James Gadsden, and three envoys of the President of Mexico General Antonio López de Santa Anna Pérez de Lebrón, signed the Gadsden Purchase, or Gasden Treaty, in Mexico City on December 30, 1853. Santa Anna needed money to help defray expenses caused by the Mexican War and ongoing rebellions, so he sold land to the United States. 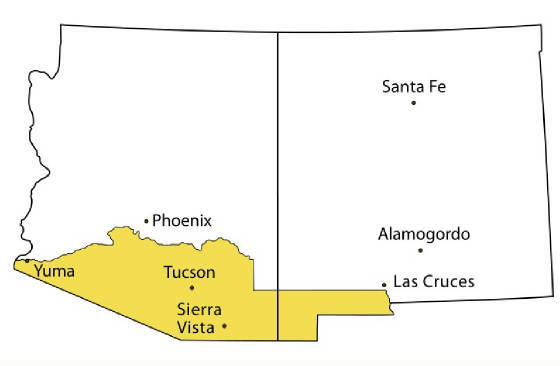 The treaty, amended and finally approved by the U.S. Senate on April 25, 1984, settled the dispute over the exact location of the Mexican border west of El Paso, Texas, giving the U.S. claim to some 29,600 square miles of land, ultimately for the price of $10 million. The land is what is now southern New Mexico and Arizona. The Mexican Republic agrees to designate the following as her true limits with the United States for the future: retaining the same dividing line between the two Californias as already defined and established, according to the 5th article of the treaty of Guadalupe Hidalgo, the limits between the two republics shall be as follows: Beginning in the Gulf of Mexico, three leagues from land, opposite the mouth of the Rio Grande, as provided in the 5th article of the treaty of Guadalupe Hidalgo; thence, as defined in the said article, up the middle of that river to the point where the parallel of 31° 47' north latitude crosses the same; thence due west one hundred miles; thence south to the parallel of 31° 20' north latitude; thence along the said parallel of 31° 20' to the 111th meridian of longitude west of Greenwich; thence in a straight line to a point on the Colorado River twenty English miles below the junction of the Gila and Colorado rivers; thence up the middle of the said river Colorado until it intersects the present line between the United States and Mexico. The several provisions, stipulations, and restrictions contained in the 7th article of the treaty of Guadalupe Hidalgo shall remain in force only so far as regards the Rio Bravo del Forte, below the initial of the said boundary provided in the first article of the treaty; that is to say, below the intersection of the 31° 47'30'/ parallel of latitude, with the boundary line established by the late treaty dividing said river from its mouth upwards, according to the fifth article of the treaty of Guadalupe.